Kareena Kapoor Khan was in Mumbai for just two days to perform at the Miss India 2018 gala event. Now, she is back in London and so is her extended family! We had earlier reported that Saifeena will travel across Interlaken and Gstaad in Switzerland with Randhir, Babita, Karisma Kapoor and Karishma’s kids Samaira and Kiaan Raj. Yesterday, this happy bunch went out for lunch in London. Joining them was Kunal Kapoor, Shashi Kapoor and Jennifer Kendall’s son. They posed for a pic together but the family missed Taimur Ali Khan at the lunch. Karisma Kapoor took to Instagram to share this picture worth a million bucks. 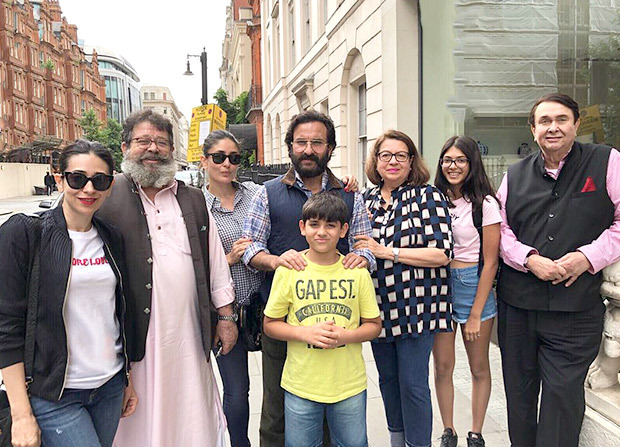 She captioned the picture as, “#familylunch missing taimur #londondiaries.” We reckon, he must be resting or simply not in the mood to step out. On work front, Kareena made a smashing comeback with Veere Di Wedding and is now all set to spend some quality time with her baby boy Taimur Ali Khan who is seen frequenting mommy’s sets when she’s working. Saif will concentrate on shooting for his Netflix special Sacred Games. Bebo will make time for Taimur till then. She starts shooting for Karan Johar’s film with Akshay Kumar by the end of this year. Saif Ali Khan in the latest interview said that he can’t get enough of his baby as he is a great source of energy to have around. As parents they are overwhelmed with the kind of love and support the Taimur gets from across the nation and are worried that he might get spoiled with all the attention. Check out the Kapoors’ family pic down below. #familylunch???? missing taimur ❤️ #londondiaries???????? #twinning???? in @balenciaga #sisterswag #onpoint???? #sistersquad #londondiaries???????? KENDALL, CARA, GIGI AND JOE – GIRLS JUST WANNA HAVE FUN!